Zucchini and eggs were meant for each other. They are found together in a whole assortment of Italian dishes, perhaps most notably as a frittata. Zucchini cacio e uova is another example of this pairing, where the zucchini rather than the eggs star. 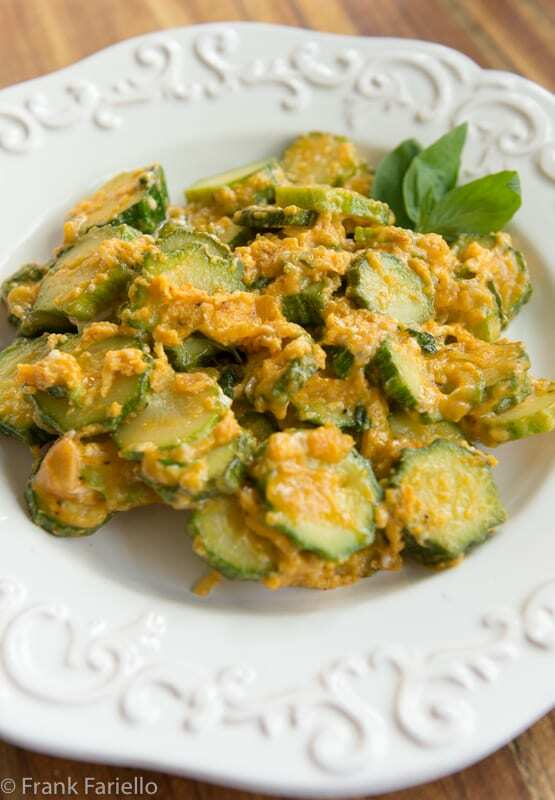 Zucchini is sautéed with onion and perhaps a bit of tomato until tender. Then, just before serving, they are bathed in a mixture of grated cheese and beaten egg (cacio e uova) until the zucchini is napped in a creamy ‘sauce’. The ingredients are much the same as for a zucchini frittata, and yet here they yield a very different dish, perfect as a substantial side for roasted or grilled meats, or as a vegetarian main course for a light lunch or supper. Add the sliced zucchini and (if you want) a bit of pureed tomato, season with salt and pepper, mix well and cover, allowing the zucchine to stew, stirring occasionally, about 10 min, or until tender. Add a bit of water if things get too dry. Finally, uncover the pan and turn off the heat. Add the eggs, which you will have beaten in a bowl together with grated pecorino and chopped basil or parsley, to the pan. Fold the egg mixture gingerly into the zucchini slices, until the eggs have formed a creamy sauce that clings to the zucchini. Serve with some crusty bread. If you’re a cheese maven like myself, you can sprinkle some additional pecorino on top. The quality of the zucchini will make or break this dish. If you have a farmers market close by—or you can grow your own—you’ll be blown away at how much more flavor your zucchini have than the ones you’ll typically find at a supermarket. This week I found these babies—a striated variety that reminded me of the zucchine romanesche I used to find back in Rome. 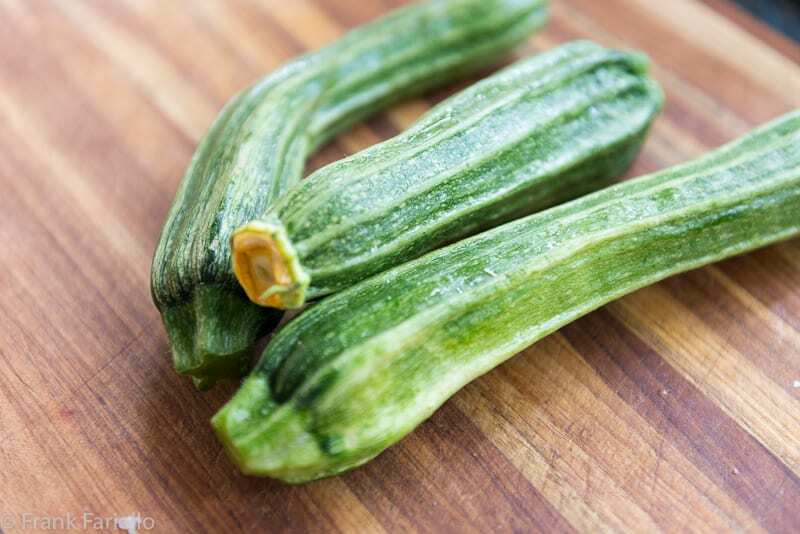 Otherwise, look for the smaller, lighter colored zucchini. To me, they have more flavor. You can use the same cacio e uova sauce with other vegetables. Angelina used to make peas this way, but artichokes and asparagus are wonderful too. Meat stews can also get cacio e uova treatment, as in agnello e piselli (Lamb and Peas). And it is also quite good on its own as a dressing for pasta. If you have any qualms about less than fully cooked eggs, you can keep the pan on heat as you mix the eggs into the veg, letting the eggs cook rather more stiffly. Or just use pasteurized eggs. For a more refined baked version, place the cooked sliced zucchini in a baking dish (or individual ramekins), pour over the egg and cheese mixture, top with more cheese and butter, and bake in a hot oven until the eggs are set and a nice golden crust has formed on top. Or you can make a delicious soup by adding water or broth to the sliced zucchini, allow them to simmer for a few minutes, then add your egg and cheese mixture and simmer some more, just long enough for the eggs to set. Serve with some crusty bread. If you're a cheese maven like myself, you can sprinkle some additional pecorino on top. Reminds me of my grandma’s cooking. She also made it with chicken. Always remember her scrambling the eggs and cheese. Thanks for the recipe. I totally agree with you that zucchini and eggs are meant for each other. Zucchini and cheese as well. And I don’t care whether they are ubiquitous or not, I love zucchini. I will try your recipe, since I have not had this combination of ingredients. Hope you enjoy it, Simona! … anyway: thanks to this post, this has just become my supper tonite: very good! I used three small courgettes and one egg for two portions. I then checked my notes: apparently I used to make also a soup based on this combo: tiny courgette cubes, ditalini pasta, egg and cacio enrichment in the end, plenty of basil…. That’s fantastic, Stefano. Glad you enjoyed this version. I’ll need to try it your way next time. And thanks for the shout out on your blog! Thank you for the awesome recipe, Frank! You’re welcome, guys. This’ll be especially awesome made with zucchine from the family garden! My neighbor, who is Italian, told me of a similar recipe yesterday. I will have to try yours and thank you for all your good tips. I followed a similar recipe the other day and it was delicious so I am thrilled to find a similar recipe with the addition of tomato puree, which I will make for supper tonight. Your picture looks mouthwatering! Hope you enjoy it, Susie! Great post as usual Frank!! Like several others who commented here, this is new to me too. I’ve certainly made my share of zucchini frittate, but now I’ll this dish to my repertoire, thanks to your post. questa ricetta è nuova per me, amo le zucchine e la voglio fare ! Buon 4 luglio Frank ! And thank you for stopping by, Paola. A perfectly respectable summer time dinner with a salad – I love it! Fantastic! Or, Fantastico! What a treat. I never thought about the affinity zucchini and eggs have fore each other. Interesting. Need to play with this combo, more. Really like this recipe — so full of flavor and very satisfying. Thanks! Thanks for stopping by, John! I think you’ll like this combination. Frank – what a great and versatile recipe! I think the first version I will make is baked in individual ramekins… I was also imagining this “sauce” on fennel! I bet that would be fantastic, David. What a marvelous idea. I’ve never heard of using zucchine with eggs. My mamma used eggs a lot with asparagus — my papà’s favorite. I can’t wait to try this. Happy Independence Day!! Asparagus is excellent, too, but this is worth a try. Happy 4th to you, too!